Grind the oats in a food processor and mix it with adequate amount of olive oil. Apply this mixture on face and neck and gently rub this on your face and neck with help of fingertips. Allow the oil to get absorbed in your skin. After 10-15 minutes rinse your face with lukewarm water to open skin pores and then with cold water to close skin pores. Mix 1 teaspoon of finely ground Oatmeal with 1 teaspoon of Yogurt then gently massage on your face and neck for 2-3 minutes. Let it stay on skin for 5-10 minutes and then rinse off with lukewarm water. Finally splash your cold water and pat dry your skin. Take 2-3 walnuts and grind them. Take half mashed banana and mix with walnut. Blend it well and gently rub the paste on your face and neck for 2-3 minutes.Let it stay on your face and neck for 5-10 minutes then rinse off. Take some dried kernel of corn and grind them to form coarse powder. Then form a paste by adding milk in adequate proportion. Gently massage your face and neck for 2-3 minutes. Let the paste stay on face for 5-10 minutes then rinse off. Take half cup of strawberry pulp and 2 teaspoons of honey. Mix them well to form a paste.Apply this paste on face and neck then rub 2-3 minutes with help of your fingertips.Let the paste stay on your face and neck for 5-10 minutes then rinse off. Take some pulp of apricot and mix it with the pulp of a fresh green apple. Mix them well and apply on face and neck. Gently rub on skin for 2-3 minutes and leave the mixture for 10-15 minutes. Finally rinse off with lukewarm water. Take 1 tablespoon of ground oatmeal and 1 tablespoon of milk powder. Add 1 tablespoon of pure water to make a paste then apply and massage onto your face and neck in circular movements. Scrub for 2-3 minutes with fingertips. Let it stay for 10-15 minutes then rinse off with lukewarm water. (i)Never scrub on acne, burned, damaged, wounded or irritating skin. (ii) Before applying any kind of scrub, first clean your face and neck with warm water and soap to remove all kinds of cosmetics, dirt and dust. (iii)If you are allergic to some natural ingredients then avoid such scrubs which contain any of the ingredient which may create itching or allergic effects in your skin. 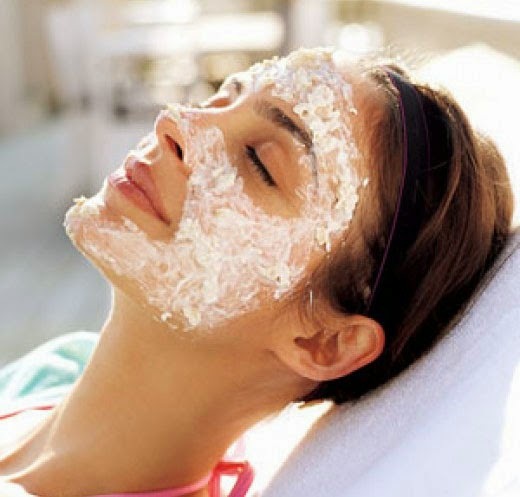 (iv)Before applying any scrub first take a small Patch Test on little area of your skin and wait for 10 to 15 minutes. If it creates itching or allergic effect then immediately remove it and rinse off with cold water. (v)Place a small amount of the scrub on your fingers then gently massage your face in circular motion.You can also put the face scrub on a cosmetic pad then gently rub the pad across the face but avoid harsh strokes.You don't have to be too hard on your face because your face simply needs a gentle massage and regular circulation motion. After using the scrub gently rinse off with lukewarm water then wash your face with cold water to close skin pores and finally pat dry your skin with soft towel.